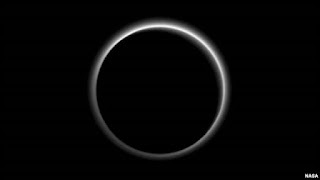 A stunning silhouette of Pluto taken by NASA's New Horizons spacecraft after it shot past the icy orb last week show an extensive layer of atmospheric haze, while close-up pictures of the ground reveal flows of nitrogen ice, scientists said on Friday. New Horizons became the first spacecraft to visit Pluto and its entourage of moons and so far has returned about 5 percent of the pictures and science data collected in the days leading up to, during and immediately following the July 14 flyby. The latest batch of images includes a backlit view of Pluto with sun, located more than 3 billion miles away, shining around and through the planet's atmosphere. Analysis shows distinct layers of haze in Pluto's nitrogen, carbon monoxide and methane atmosphere. The haze extends at least 100 miles (161 km) off the surface. "This is our first peek at weather in Pluto's atmosphere," New Horizons scientist Michael Summers, with George Mason University in Fairfax, Virginia, told reporters during a teleconferenced press briefing. As the tiny particles fall to the ground, they may trigger chemical reactions that give Pluto its reddish hue, he added. The haze layer, which extends five times farther than predicted by computer models, was not the only surprise. Pressure measurements show the total mass of Pluto's atmosphere has halved in two years. "That's pretty astonishing, at least to an atmospheric scientist. That tells you something is happening," Summers said. More details will come over the next year as New Horizons sends recorded data back to Earth. NASA also released new images of Pluto's surface, with telltale signs of a wide range of geologic activities including a Pluto version of glacial ice flows. With surface temperatures just shy of 400 degrees below zero Fahrenheit (-235 degrees Celsius), Pluto is too cold for the ice to be made of water. Instead, Pluto's surface ice consists mostly of nitrogen. "We knew that there was nitrogen ice on Pluto ... and we imagined that nitrogen was sublimating, or evaporating, in one place and condensing in another place. But to see evidence for recent geologic activity is simply a dream come true," said New Horizons scientist William McKinnon, with Washington University in St. Louis. "Recent" in geological terms does not mean yesterday, he added. Based on the lack of impact craters, scientists suspect the surface of Pluto is less than a few hundred million years old, a fraction of the solar system's 4.6 billion year age.